NEXCOM’s high-performance OPS player brings clearer passenger information to large displays at airports and stations for enhanced viewing experiences and engagement. Powered by 6th generation Intel® Core™ processor i5-6440EQ (codename Skylake), the bright and quiet NDiS M535 delivers personalized, up-to-date information and 4K video while its remote manageability makes it easy to deploy, monitor, and manage. With latest Intel® HD Graphics and HEVC codecs, the OPS player bolsters triple independent outputs supporting 4K display with 60Hz refreshing rates. Higher refreshing rate allows flight information display systems (FIDS) to play smooth and crystal clear flight information, which enhances a more pleasant, non-flickering viewing experience. Besides smooth 4K displays, the OPS player accelerates active engagement, suitable for interactive kiosks. Dual DDR4 SO-DIMM memory sockets with up to 32GB at 2133MHz dash high-speed responsiveness while fast USB 3.0 ports facilitates interactive peripherals including touchscreen displays, cameras, and access control readers via RFID, NFC or fingerprints. Coupled with 3G, 4G, or Wi-Fi modules, the NDiS M535 can effectively guide passengers to their destination or duty-shop purchase with up-to-date and personalized information such as discounts, real-time flight/train information, wayfinding assistance, and weather forecast. 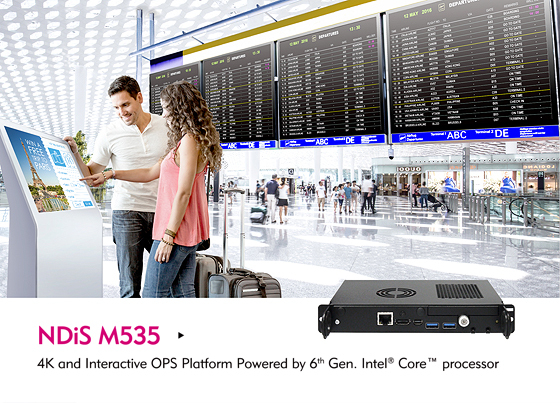 For large-scale deployment in airports and transportation terminals, the NDiS M535 features plug-in OPS design and shrinks installation from hours to minutes. Upfront HDMI 2.0 and DisplayPort ports add compatibility with both old and new displays. Using Intel® Active Management Technology (Intel® AMT) the OPS player can be remotely powered on and off while offering out-of-band system access. Since Intel® AMT allows the OPS player to be remotely accessed and diagnosed, software issues can be repaired wirelessly while failed hardware components can be identified in advance for preventive maintenance, thus lowering maintenance costs and onsite visits. Powerful graphics and swift-responsiveness also make the versatile NDiS M535 suitable for digital whiteboards in schools and enterprises. Designed to bring a non-distracting viewing experience during school presentations and corporate meetings, the OPS player equips smart fan control, which automatically adjusts fan speed with CPU loading. It offers improved thermal performance while reducing noise level by 25 percent.